Jaysh al-Mu'ammal is an Iraqi Shi'a militia that emerged in June 2016. 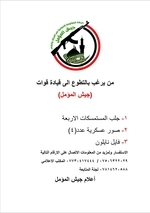 It is also known as Liwa al-Mu'ammal, and thus bears a striking similarity to the Liwa al-Mu'ammal that was announced in 2014 to have been formed with the assistance of the Rapid Intervention Regiment, another Iraqi Shi'a militia known for fighting in the Damascus area. 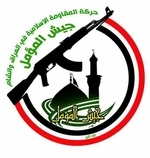 Indeed, it is notable that the same circles are now promoting this Jaysh al-Mu'ammal, led by one Sa'ad Sawar, based out of Sadr city in Baghdad and intended principally to fight in Iraq and Syria. A critic in the Sadrist movement has asserted that this formation is a splinter from the Sadrist movement and Muqtada al-Sadr's militia Saraya al-Salam, and that it has been provided arming and funds by ex-PM Nouri al-Maliki. In this context, it should be noted that other Sadrist splinters like the Abu al-Fadl al-Abbas Forces are similarly associated with fighting in Syria. One of the formations of Asa'ib Ahl al-Haq, which also originated as a Sadrist splinter, congratulated Sa'ad Sawar on the creation of Jaysh al-Mu'ammal. Jaysh al-Mu'ammal has also indicated a desire to fight in Bahrain and Yemen in defence of fellow Shi'a, though no evidence yet points to such deployments.